The following pages are from some rule books I read on occasion that detail the official rules for lighting, hand signals and whistle signals as used by the railroads to communicate with and between and to afford protection to the members of the train crew. The pages are presented here simply to provide guidance in the use of all these cool new light and sound effects the world of DCC has enabled us with. Bear this in mind. There is no right wrong way to run your model trains. If you like simulating prototype operations, well then... Enjoy! The rules are taken from the rule book titled Pennsylvania Lines West of Pittsburgh Rules for the Government of the Transportation Department to take effect May 29, 1910. 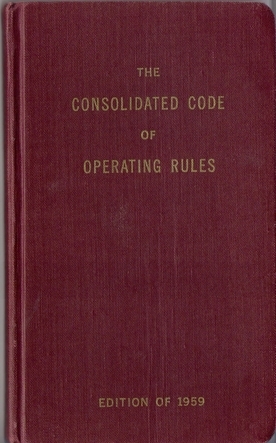 These rules remain unchanged, except as noted in the rule book titled Consolidated Code of Operating Rules - Revised 1959 to take effect December 1, 1959. While not necessarily a standard of railroad communication, the NATO alphabet is surely useful to provide clear and accurate communication of information. Here is a copy of this standard. Streamlined Backshop is a proud supporter of the NMRA and OPSIG.